Flight school student in Vero Beach steals Olay cosmetics from Target. VERO BEACH – A 26-year-old flight school student was caught stealing $340.09 worth of Olay cosmetics from the Target store in Vero Beach. 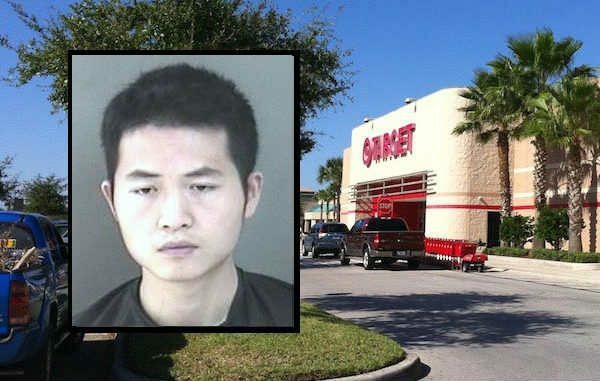 Cheng Li was arrested on charges of felony grand theft after walking about the Vero Beach Target with bags full of merchandise. A loss prevention officer called the Indian River County Sheriff’s Office after observing Li making several trips with “bags full of merchandise that he did not pay for” while passing all points of sale, according to the report. The officer witnessed Li conceal several Olay cosmetics in an empty bag as he entered the restroom, the report said. While leaving the Target parking lot in a Silver Chevrolet Trailblazer, a deputy was able to make a traffic stop. After placing Li into handcuffs, he told deputy that he “would pay for the items now.” He told deputies that took the items for his child and child’s mother. Li stated several times that he was sorry and wished to pay for the merchandise. He said he was attending flight school in Vero Beach and this incident will get him kicked out of the program and sent back to China. Li was arrested and transported to the Indian River County Jail.